The defending champs are moving on. Kahuku outscored visiting Kailua in every quarter for a 54-38 opening round win in the Snapple Division I Boys Basketball Championships at Thomas G.S. Walker Gymnasium Monday night. 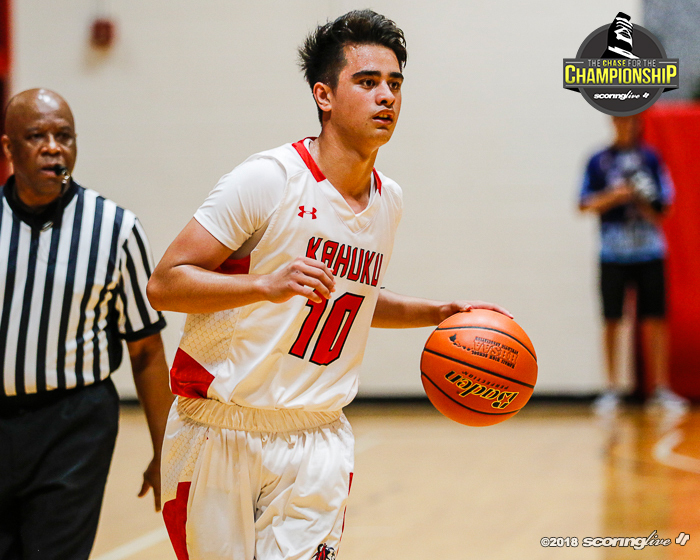 The Red Raiders, the Oahu Interscholastic Association D1 runner-up and sixth-ranked team in the ScoringLive/Hawaiian Electric Boys Basketball Power Rankings, moves on to face No. 9 KS-Hawaii, the Big Island Interscholastic Federation D1 champion and fourth-seeded team in the tourney, on Wednesday at Moanalua's gymnasium. Tip-off is slated for 5 p.m.
Tolu Smith had 20 points and 10 rebounds while Ethan Erickson had 10 points and three steals to lead Kahuku (25-4) in the win. Everett Torres-Kahapea had 14 points to lead the Surfriders, who saw their season come to a close with a 18-12 record. Kailua momentarily had a lead, 6-4, in the opening period after back-to-back steals by Aaron Mejia, which forced a Kahuku timeout at the 3:12 mark. The Red Raiders regained the lead after a right wing triple by Lokana Enos and never trailed the rest of the way. The Red Raiders worked it inside the paint for most of the night and drew most of the calls. Kahuku shot 29-for-40 from the free throw line while Kailua was just 2 for 6 at the charity stripe and was 4 of 21 from beyond the arc. By comparison Kahuku had just six shot attempts from three-point territory. Kahuku also won the regular season matchup between the two teams, 49-37, a few weeks ago on Jan. 25.